There is a satellite laboratory at Halton Hospital, which is mainly used for urgent work produced at Halton Hospital. The facilities in Appleton Wing were first opened in 1978, with refurbishments in 1997 and 2001. In 2005, the Cervical Screening section of the Cytopathology Department relocated into modified accommodation in North Lodge and in 2011 was merged with that of Whiston Hospital’s onto their site. There are 11 Consultant Pathologists and 2 Associate Specialists in addition to approximately 140 Biomedical Scientists, Support Workers, Phlebotomists and Mortuary staff. This team provides the analytical and interpretive service for the four main Pathology disciplines listed below. Biochemistry and Haematology operate a 24/7 service and Microbiology and Mortuary operate an on-call service. A Consultant Pathologist from each discipline is always available for clinical advice and may be contacted via the hospital switchboard. The Pathology Department provides services to a number of external organisations in addition to Warrington and Halton Hospitals and GPs. 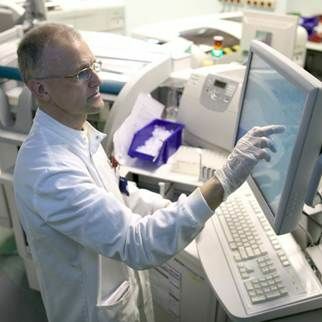 The preferred method of requesting Pathology tests is via the electronic system using Sunquest ICE. Not only does this streamline the data input, but it also improves the quality of the data. Results will be electronically transmitted to GP mailboxes within the ICE system. There are regular scheduled collections from GP surgeries. Urgent requests during normal hours do not need a preceding telephone call. However, urgent requests should be marked in the “URGENT” section of the request form to ensure a faster turnaround time and the sample/s should be submitted in a red pathology bag. This identifies the sample/s as requiring priority processing to ensure results are available by 17:00hrs. For Glucose Tolerance Tests (GTT) appointments are made via the Choose & Book system. RESULTS: Critical abnormal results according to a pre-determined set of values will be telephoned to the requesting GP as they are generated. a. The GP contacts the appropriate Duty Biomedical Scientist via Switchboard (01925 635911). See contact details below. b. A contact telephone number MUST be given by the requesting GP so that results can be returned to the correct source. NOTE: The On-Call Microbiology staff may be off site during their period of on-call cover. It is therefore essential that they are contacted through the Hospital switchboard to advise of any urgent investigation that is required. CONSULTANT ADVICE: A Consultant Pathologist from each discipline is always available for clinical advice and may be contacted via the hospital switchboard. All samples and request forms MUST have a minimum of THREE identifiers on them – see our Laboratory Users’ Handbook for more details. Also consult this handbook for Danger of Infection (High Risk) samples.